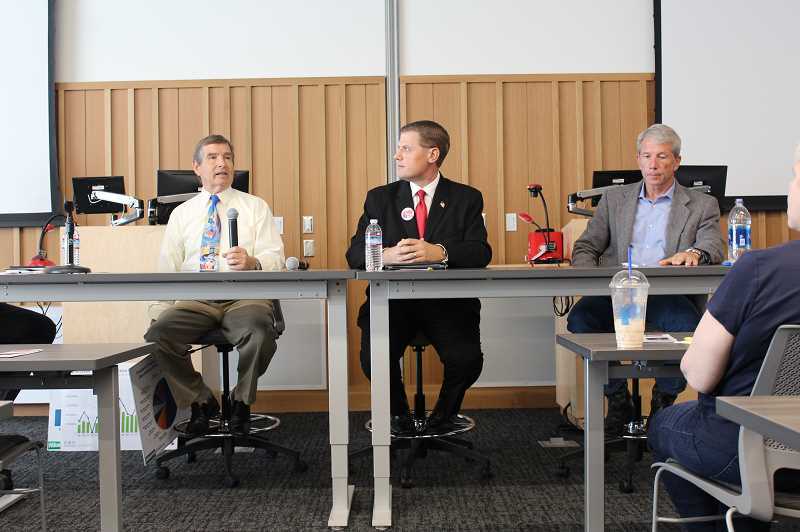 Three candidates for the U.S. House participated in a debate on Monday, Oct. 15 at Clackamas Community College's Harmony Campus, hosted by the North Clackamas Chamber of Commerce. Among the candidates for U.S. House of Representatives, District 5, are incumbent Kurt Schrader (D) of Canby, Mark Callahan (R) of Oregon City and Marvin Sandnes (Pacific Green Party) of Salem. Dan Souza (L) is also running, but was not present at the debate. Schrader, a retired farmer and veterinarian, is currently serving his fifth term and aims for a sixth. In his opening statement, he pointed to his business background and his track record in office. 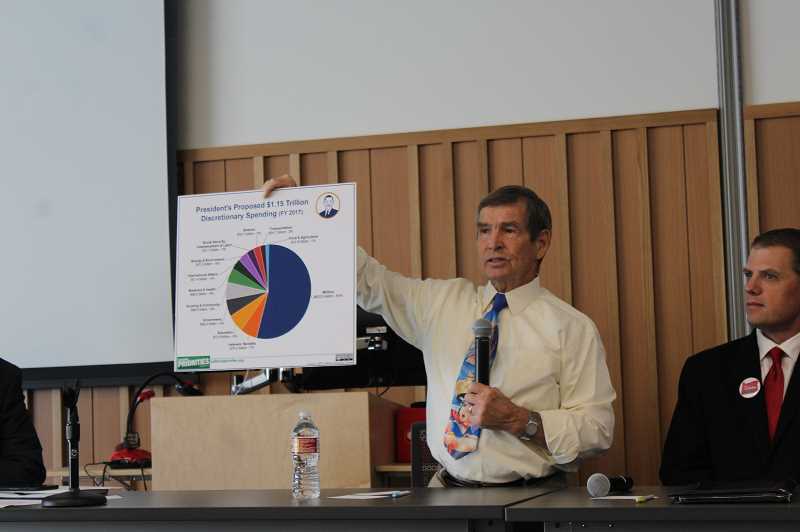 "Quite simply, I think I represent the district very well," Schrader said. "I represent the diversity. I don't campaign just for the Democrats, I campaign for everybody in this district." Schrader's Republican opponent, Callahan, has been criticized as being a perennial candidate, having run for multiple offices under various political party affiliations over the years. He denies this, calling the criticism "fake news," though he confirmed that he has run for several offices under different parties since 2009. When he first became involved in politics in 2009, he said he didn't have a political affiliation and had to become a Democrat to run for a position in the Oregon Legislature. Then, in 2010, he said he ran as a Pacific Green Party candidate in collaboration with Republican candidate Bill Young to take votes from Democratic candidate Nancy Nathanson. "At the end of 2011, I became a Republican," Callahan said, "and I've been a Republican ever since because being Republican lines up with my values." Callahan even ran for president in 2012, making the ballot in New Hampshire and Arizona. When asked why he is so eager to gain a political office, he referred to comments from his opening statement at the debate. "Why am I out there doing it?" Callahan said. "I give them one answer. The answer is love. It's about the love of country. It's about the love of family. It's about the love to actually get off the couch, stop watching TV and complaining and actually get out there and do something about what we see happening to our great nation. Ladies and gentlemen, it's about love to me." The third debater, Green candidate Sandnes, told the audience he runs every other year as a platform to talk about redirecting funds from war toward saving the environment. "This war is destroying our culture—morally, physically, mentally," Sandnes said. When the topics of climate change, sanctuary cities and Trump came up, the candidates differed in their opinions. "Climate change is very real," Schrader said. "I mean, you have to have your head in the sand to not realize that, even here in the Pacific Northwest…I believe man has a lot to do with it. Whether or not you believe that though, I would hope as a good steward of this planet, you'd try and do something about it." In a 2014 encounter with Willamette Week's Nigel Jaquiss, Callahan said climate change is a myth, to which Jaquiss responded, "Where are you on the Easter Bunny?" Callahan escalated at that point, calling it a "childish question." The interviewing team threatened to remove him, and Callahan said, "Who do you think you are?" After that, and having called Jaquiss out about writing "Blah, blah, blah" on his notebook while fellow candidate Joe Rae Perkins spoke, Callahan was thrown out of the interview. But he got in one last word. "I know it's a meeting being asked by thin-skinned liberals like yourself," he said. Callahan has since changed his tune on the topic that helped get him thrown out of that interview. At the debate, Callahan suggested climate change should be separated into the categories of "natural climate change," and "manmade climate change," and noted that the answer to the manmade variety is not cap and trade, but being good stewards of the environment. Sandnes took the opportunity to talk about shifting funds from war efforts to environmental efforts. "Boy, I'll tell ya, saving our oceans," Sandnes said. "I think the number is either 40 or 60 percent of our oxygen comes from the Pacific Ocean plankton. The ocean is dying. We've gotta do something about it. We have a huge, this trillion dollars a year we're wasting on security. You know, we could cut that in half, easily, and be secure. So let's redirect this resource toward saving our planet for our grandkids." The candidates had a range of opinions regarding sanctuary cities too. Schrader said as far as sanctuary cities go, that should remain a local decision. But at the state level, he supports Oregon being a sanctuary state and noted that immigrants he knows are "extremely hardworking." He also noted the need for immigration reform, not in the form of tougher security, but finding a way to deal with families escaping drugs and oppressive governments. Callahan disagreed wholeheartedly, calling national security one of the primary responsibilities of our country. "If you're gonna be here, you gotta be here legally, period," Callahan said, "not break into our country, break our laws, not be accountable to the people that are already here, that are U.S. citizens that are already here." Sandnes leaned towards Schrader's views and pointed to the Declaration of Independence. "If you are in the United States, you are entitled to due process," Sandnes said. "That is who we are. We are America, and we are not like any other country. We respect due process, and we are all created equal." During the debate, the president came up several times, and each candidate tossed out their view of him. "I'm not a fan of this particular president, to be very honest with you," Schrader said. He suggested there's a more civilized way to go about discussions with countries over trade and said it's not a good idea to go to war with world, economically. But he did acknowledge the value of some of Trump's work on alleviating over-regulation on businesses. In stark contrast, Callahan praised Trump's tax cuts and jobs act and found nothing negative about the work of the current president. "I think Trump is doing an excellent job," Callahan said. Sandnes said he was impressed that Trump began a dialogue with North Korea and reopened dialogue with Russia, but was quick to note that he didn't vote for Trump. "Well, I'm no Trumper, I'll tell you that," Sandnes said. "When the guy said, 'I don't read, I watch TV,' my knees buckled." In the end, of course each of the candidates asked for the votes of the members of the audience. Schrader promised to continue to work across party lines, and Callahan too promised to work for everyone despite his deeply conservative values. But Sandnes took a bit of a different angle. "If you vote for me, I'm not gonna win," Sandnes said. "We got 3.7 percent in 2016. If I got 6 or 8 percent this time, both ruling parties would freak out."